‘the Kendo Reader’ this recommended work by Noma Hisashi, written in the 1930’s can be found here . 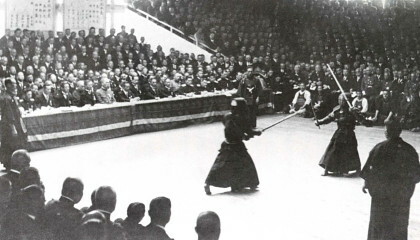 This picture is of Fujimoto Kaoru (Gyaku nito) fighting with Noma Hisashi in the final of 1934 Tenran shiai – a series of three competitions held in front of the Japanese Emperor. Noma Hisashi was the winner of this competition. In 1937 at the age of 28 very sadly he died. This work then is a living testement to a very special Kendo person.